This is a classic tour organized every week from May to October and our most popular tour. 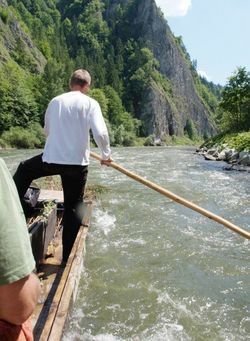 You may have heard of the Dunajec raft trips, one of the earliest attractions in Europe to be organised especially for tourists. The famous, deep gorge of this river forms a natural border between Poland and Slovakia. Following the cessation of border controls a few years ago and with the building of a new suspension bridge this natural wonder finally became accessible to cyclists as well. 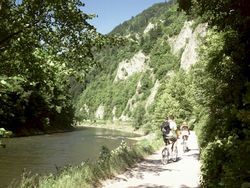 Other stretches of the Dunajec valley have paths that are just as beautiful taking you past the folk traditions of the Goral and Spisz people. 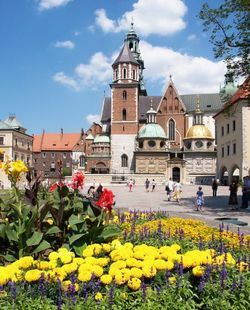 We invite you to a week-long tour, beginning and ending on a Saturday, with the first and last nights spent in Krakow and five nights in villages and towns in the mountains. Bikes are selected at our cycle hire centre in the middle of the Old Town our tour of Krakow, a former capital of Poland gets underway. The city that was once the residence of Polish kings is on the UNESCO World Heritage list and boasts a historic architecture which came through the Second World War unscathed. Among Krakow's most important architectural treasures are St Mary's Church with the world-famous altarpiece carved by Veit Stoss; medieval buildings of Jagiellonian University, Poland's oldest university; Wawel Cathedral adjacent to the 11th century Wawel Castle; Europe's largest medieval town square; Kazimierz, the former Jewish quarter; the promenade along the Vistula at the foot of Wawel Castle. On our cycle tour we visit the "Planty", attractive gardens laid out around the Old Town on the site of the earlier medieval city walls. At about midday a minibus takes us to Podhale. Our destination is the village of Zab, Poland's highest village. The journey takes about 2 hours. The first ride will be to Gubalowka, from where we can enjoy a panoramic view of the High Tatras. We then cycle down the mountain, past farm carts laden with hay. After a short rest at the point where the Poroniec and Zakopianka streams join the White Dunajec, we ride through the village of Olcza to Zakopane. Our accommodation here is not far from Krupowki, Zakopane's main street, a pedestrian area lined with lively cafés and shops. Zakopane has developed a very distinctive cultural character. The folk culture of the people who live in the Tatras, the Gorale, has been preserved in their music, their songs and their local costume. And the characteristic "Zakopane style" of timber architecture, which developed around the turn of the twentieth century, can be found nowhere else in Europe. During our break we can sample "oscypek", the delicious smoked ewe's-milk cheese made in the Goral houses here. 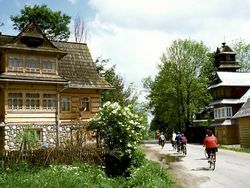 We take the cable car back to the top of Gubalowka and then cycle down through the village of Dzianisz as far as Chocholow, a village which is now a "living open-air museum" of timber architecture, where we have lunch in the village inn. From here you can take advantage of latest investments: We cycle on an excellent, flat, scenic, dedicated cycle road, that was built on the former railway track. We pass Ludzmierz (with a famous Marian pilgrimage shrine), ond arrive to the town of Nowy Targ, the main town of the Gorale mountain people. The stretch today leads us through what is known as the "green Dunajec Gorge", where the river passes between two ranges of the Beskids. Although there are no limestone cliff walls here, the slopes with their beech woods are still very impressive. We soon leave the main road, crossing the river on a suspension bridge to the right bank and making our way between the paths among the farms of the village of Tylmanowa with glimpses of the old barns, granaries and hen-houses though open doors. We stop for lunch at a guesthouse in Lacko, known for its strong slivovitz, a plum brandy. 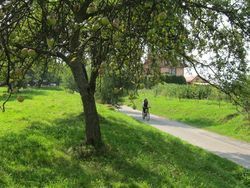 It is also possible to halt alongside fruit gardens on the valley slopes. 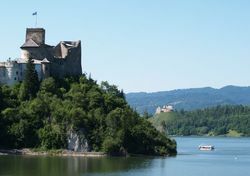 At Golkowice we leave the Dunajec and ride to Rytro, an old feudal village at the foot of castle ruins. On our last evening we have a dinner with grilled trout fresh from the river. 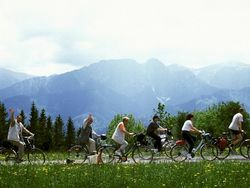 After breakfast we take a 15 km ride through the Poprad Valley to Stary Sacz, although yo may prolongate the tour and cycle upstream the river to spa town Piwniczna. Early afternoon is spent exploring Stary Sacz - the historic little town, one of the most beautiful in southern Poland, cycling through the maze of narrow streets for a feel of the atmosphere of past times. 2019 update: We have been using a new route which uses a bridge over the Poprad river built especially for cyclists; This comfortable path leads to Nowy Sacz, another historic town, with a large market square and art-deco houses. A pedestrian zone with variety of restaurants is a perfect place for lunch. After lunch we return to Krakow (bus journey about 2 hours). Our accommodation for the last night is usually in the same hotel as on the first night, but we will spend the rest of the day in the quiet Kazimierz district, once the Jewish quarter of the city. An evening of Klezmer music brings the tour to a close. If desired you can extend your stay in Krakow or take part in other tours such as Steppes and Marshes, Cycling in Silesia, weekly cycling tours towards Warsaw, Budapest or Vienna. The entire tour is over flat or gently undulating terrain. The climbs are no problem even for less adept cyclists or children. Day 6 has two slightly longer climbs (about a 150 m height differential. 10 Persons or more - same price as regular tour.